UNNI UNNI - Premium quality: bpa-frEE Utersils and cutlery made from premium quality corn starch. 100% free of harmful bpa chemical, 100% safe to use, and 100% compostable. 100% free of harmful bpa chemical, 100% safe to use, and 100% compostable. Strong and sturdy: superior strength for all parties and occasions. High temperature resistent up to 185 degree F.
100% compostable: made according to us bpi and Euro DIN CERTCO certification standard. Comfortable and firm handle. We also have individual compostable spoons, forks and knives package. Premium quality: bpa-free utersils and cutlery made from premium quality corn starch. 100% environment friendly. Ergonomically designed for superior grip. UNNI 100% Compostable Biodegradable Corn Starch 6.5" Spoons, 100-Piece ,US BPI and European DIN CERTCO Certificated,Premium Quality & Sturdy Plant Starch Cutlery/Utensiles/Flatware,High-Heat Resistant - Pleaes search b06xc68tf1 for compostable spoons, B06XC5921Z for forks, and B06XBZZ7RQ for knives. Earth's Natural Alternative ECOL003pk50 - They are an environmentally beneficial alternative to plastic or Styrofoam, or paper, which contain non-biodegradable and petroleum derived materials, which requires the cutting down of trees. Tree-free, environmentally beneficial, compostable in any industrial composting facilities. Can be used for both hot and cold foods. Material is gluten free - made from the plant stalk not grains, which store the proteins and allergens. Their natural tan, church luncheons, bleach free coloring is perfect for any occasion - picnic, barbecue, holiday parties and get togethers, weddings, dye free, bridal showers, carnivals, fairs or everyday use. Earth's Natural Alternative Wheat Straw Fiber, Bagasse Sugarcane Tree Free 11.5oz Bowl, 50-Pack - Built sturdy from environmentally beneficial natural, renewable plant fibers, they can be used in the microwave - as they are heat safe up to 200 degrees Fahrenheit - and are oil/liquid and cut resistant. Material is gluten free, made from the plant stalk not grains. Our earth's Natural Alternative 11. 5 oz.
. They are compostable in either a industrial compost 1-6 months or a home compost up to 12 months. All occasion heavy-duty bowl, 50 in each case is made from 100 percent sustainable and renewable natural wheat stalk fiber and bagasse sugarcane fiber. 50 in each case, 11. Earth's Natural Alternative ECOP013pk50 - Tree-free, environmentally beneficial, compostable in any industrial composting facilities. The material is derived from the plant stalk, not the actual food grains, which are where the proteins and allergens are stored, which makes them by FDA standards gluten-free. The coloring is perfect for any occasion - picnic, carnivals, church luncheons, bridal showers, barbecue, holiday parties and get togethers, weddings, fairs or everyday use. Made from unbleached, pesticide free, dye free, chlorine free, natural discarded wheat stalk and bagasse sugarcane fiber. Microwave safe and is liquid/oil resistant. Built sturdy from environmentally beneficial natural, renewable plant fibers, they can be used in the microwave - as they are heat safe up to 200 degrees Fahrenheit - and are oil/liquid and cut resistant. Earth's Natural Alternative Wheat Straw Fiber, Bagasse Sugarcane Tree Free 9" Plate, 50 Count - Material is gluten free - made from the plant stalk not grains, which store the proteins and allergens. 50 in each case, 9" Plate. They are compostable in either a industrial compost 1-6 months or a home compost up to 12 months. Can be used for both hot and cold foods. Material is gluten free - made from the plant stalk not grains, which store the proteins and allergens. 50 in each case, 11. GreenWorks - Tree-free, environmentally beneficial, compostable in any industrial composting facilities. Fda certified. Bpa free, healthy and reliable. Cpla forks made from non-gMO corn starch, tree free, plastic free, renewable and natural.6. 7" large size, heavyweight, Heat tolerant to 185℉. 100 pieces forks packed in a biodegradable and compostable color box instead of plastic bags which are not degradable. Material is gluten free - made from the plant stalk not grains, which store the proteins and allergens. 50 in each case, 11. 5 oz. Made from unbleached, dye free, pesticide free, chlorine free, natural discarded wheat stalk and bagasse sugarcane fiber. Microwave safe and is liquid/oil resistant. Can be used for both hot and cold foods. GreenWorks 100% Biodegradable Compostable CPLA Disposable Cutlery Forks,100 Ct 7" Large Heavyweight Bio-Based Plastic Flatware Forks - Tree-free, environmentally beneficial, compostable in any industrial composting facilities. 50 in each case, 9" Plate. We insure our customer away from pollution, away from unhealth, and away from low quality. We appreciate your concerns about environment. Your satisfication is our final target, please kindly let us know, if your have any question or any suggestion, we will be pleased to answer you and help you to resolve any problem. Repurpose Compostables SYNCHKG125415 - Tree-free, environmentally beneficial, compostable in any industrial composting facilities. 100% compostable and biodegradable, bpi certified to meet ASTM D6400 and EN13432 Standard, good for earth and soil. Bpa free. Can be used for both hot and cold foods. Fda certified. Bpa free, healthy and reliable. Cpla forks made from non-gMO corn starch, tree free, plastic free, renewable and natural. 6. 7" large size, heavyweight, Heat tolerant to 185℉. 100 pieces forks packed in a biodegradable and compostable color box instead of plastic bags which are not degradable. No dangerous plasticizers used. Made from unbleached, pesticide free, chlorine free, dye free, natural discarded wheat stalk and bagasse sugarcane fiber. Repurpose 100% Compostable Plant-Based Clear Cold Cup, 12-ounce 50 Count - Microwave safe and is liquid/oil resistant. Repurpose 100% compostable plant-based Clear Cold Cup, 12-ounce 50 Count 50 in each case, 11. 5 oz. Made from unbleached, pesticide free, dye free, chlorine free, natural discarded wheat stalk and bagasse sugarcane fiber. Microwave safe and is liquid/oil resistant. Can be used for both hot and cold foods. GreenWorks - Fda certified. Bpa free, healthy and reliable. Cpla forks made from non-gMO corn starch, tree free, plastic free, renewable and natural.6. 7" large size, heavyweight, Heat tolerant to 185℉. 100 pieces forks packed in a biodegradable and compostable color box instead of plastic bags which are not degradable. No dangerous plasticizers used. 50 in each case, 9" Plate. Greenworks is working on providing green products to our customers. Our cpla cultelry meets astm d6400 and en 13432 Standard, It composts in less than 180 days in a commercial facility. Certified compostable breaks down in a matter of months. We recieved some customer complaints against other sellers for poor quality. GreenWorks 100% Biodegradable Compostable CPLA Disposable Spoons,100 Ct Large Heavyweight Bio-Based Plastic Utensils Flatware Cutlery Spoons - Made from plants and soy based inks. We insure our customer away from pollution, away from unhealth, and away from low quality. We appreciate your concerns about environment. Your satisfication is our final target, please kindly let us know, if your have any question or any suggestion, we will be pleased to answer you and help you to resolve any problem. 100% compostable and biodegradable, bpi certified to meet ASTM D6400 and EN13432 Standard, good for earth and soil. Fda certified. Bpa free, healthy and reliable. Earth's Natural Alternative ECOP001pk50 - 50 in each case, 6". Generates less CO2 than a traditional plastic cup. Made from unbleached, chlorine free, dye free, pesticide free, natural discarded wheat stalk and bagasse sugarcane fiber. Microwave safe and is liquid/oil resistant. Made from unbleached, chlorine free, dye free, pesticide free, natural discarded wheat stalk and bagasse sugarcane fiber. Microwave safe and is liquid/oil resistant. Can be used for both hot and cold foods. Can be used for both hot and cold foods. Material is gluten free - made from the plant stalk not grains, which store the proteins and allergens. Built sturdy from 100 percent environmentally beneficial natural, renewable plant fibers, they can be used in the microwave - as they are heat safe up to 200 degrees Fahrenheit - and are oil/liquid and cut resistant. Earth's Natural Alternative Wheat Straw Fiber, Bagasse Sugarcane Tree Free 6" Plate, 50 Pack - Our earth's natural alternative 6" heavy-duty cake/dessert plate is made from 100 percent sustainable and renewable wheat stalk fiber and bagasse sugarcane fiber. Tree-free, environmentally beneficial, compostable in any industrial composting facilities. Tree-free, environmentally beneficial, compostable in any industrial composting facilities. Fda certified. Bpa free, healthy and reliable. Cpla forks made from non-gMO corn starch, tree free, plastic free, renewable and natural. Transitions2earth Biodegradable EcoPure Forks - Box of 500 - Plant a Tree with Each Item Purchased! Transitions2earth 1041883 - Transitions2earth premium quality utensils and cutlery use the latest eco-friendly technology. Transitions2earth premium quality utensils and cutlery can be recycled where appropriate recycling facilities exist. Can be used for both hot and cold foods. Certified compostable breaks down in a matter of months. Transitions2earth premium quality utensils and cutlery are great for weddings, events, parties, picnics and more since they are premium quality, heat resistant and biodegradable.50 in each case, 6". Tree-free, environmentally beneficial, compostable in any industrial composting facilities. Contains 50, 12-ounce cups, clear. Transitions2earth Biodegradable EcoPure Forks - Box of 500 - Plant a Tree with Each Item Purchased! - Made from unbleached, dye free, chlorine free, pesticide free, natural discarded wheat stalk and bagasse sugarcane fiber. Microwave safe and is liquid/oil resistant. Can be used for both hot and cold foods. Transitions2earth premium quality utensils and cutlery are durable, heat resistant and heavyweight. Transitions2earth premium quality utensils and cutlery are so durable that they are dishwasher safe and can be used dozens of times, further reducing their environmental impact. 50 in each case, 9" Plate. 50 in each case, 11. 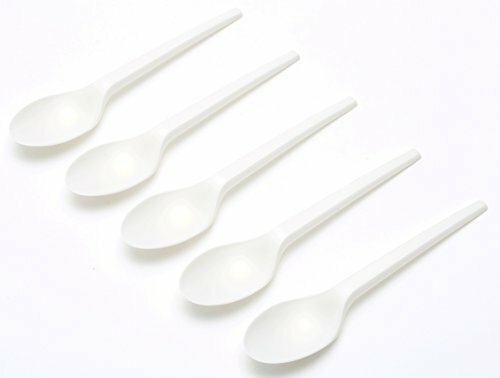 Transitions2earth Biodegradable EcoPure Economy Lightweight Spoons - Box of 1000 - Plant a Tree with Each Item Purchased! Harvest Pack HPI-12B-50 - Material is gluten free - made from the plant stalk not grains, which store the proteins and allergens. Bpa free. Recycling facilities for this product may not be available in your area. Made with bagasse, a natural compostable by-product that would have just gone to waste; our product recycles the pre-consumer by-products left during the production of sugar from sugarcane, the natural fiber are stronger yet durable and leaves no carbon footprint on our environment as it otherwise would be discarded and wasted. 100% compostable and biodegradable, bpi certified to meet ASTM D6400 and EN13432 Standard, good for earth and soil. Tree-free, environmentally beneficial, compostable in any industrial composting facilities. Contains 50, 12-ounce cups, clear. Tree-free, environmentally beneficial, compostable in any industrial composting facilities. 50 COUNT 12 oz Round Disposable Bowls - Natural Sugarcane Bagasse Bamboo Fibers Sturdy Twelve Ounce Compostable Eco Friendly Environmental Paper Bowl Alternative 100% by-product Tree Plastic Free - 50 in each case, 11. 5 oz. Made from unbleached, chlorine free, dye free, pesticide free, natural discarded wheat stalk and bagasse sugarcane fiber. Microwave safe and is liquid/oil resistant. The stated rate and extent of degradation do not mean that the product will continue to decompose or decompose completely. Recyclable - transitions2earth® premium quality utensils and cutlery can be recycled where appropriate recycling facilities exist. Harvest Pack HPI-9P-100 - 100% compostable and biodegradable, bpi certified to meet ASTM D6400 and EN13432 Standard, good for earth and soil. Fda certified. Bpa free, healthy and reliable. Made from non-gmo corn based CPLA, plastic free, tree free, renewable and natural.6. 25" large size, heavyweight, Heat tolerant to 185℉. 100 pieces spoons packed in a biodegradable and compostable color box instead of plastic bags, real 100% compostable products. Can be used for both hot and cold foods. 50 in each case, 9" Plate. So, use it, go ahead, this beauty will only regenerate itself completing the cycle of life while bringing you more convenience at the same time making a great statement and care for the environment! 50 in each case, and toss it out! There is no need to be guilty, 11. Natural Sugarcane Bagasse Bamboo Fibers Sturdy Nine Inch Compostable Eco Friendly Environmental Paper Plate Alternative 100% by-product Tree Plastic Free - 100 COUNT 9" in Round Disposable Plates - 5 oz. Made from unbleached, chlorine free, dye free, pesticide free, natural discarded wheat stalk and bagasse sugarcane fiber. Microwave safe and is liquid/oil resistant. Material is gluten free - made from the plant stalk not grains, which store the proteins and allergens. The high strength and durability of our products allows them to be used many times, further reducing their impact on the environment. Bpa-free - transitions2earth® premium quality utensils and cutlery are made from FDA certified food grade ingredients that do not contain any harmful BPA chemical. Biodegradable - lab tested - transitions2earth® premium quality utensils and cutlery have been shown to biodegrade 13% in 59 weeks. Blasso, LLC ECOVITAIFRK140 - Made from plants and soy based inks. Other products like biodegradable spoons will not be converted into good quality compost and may take many years to breakdown. Extra long utensils with convenient tray - no more having to fumble with small disposable utensils. Compostable forks 140 allow for a firm grip piercing through tough fruit or steak. Material is gluten free - made from the plant stalk not grains, which store the proteins and allergens. Provide your kids lunches or school meals with all natural non-toxic forks, spoons and knives. High heat stable & super strong - transitions2earth® premium quality utensils and cutlery will not melt, deform or dissolve into your food even in very hot foods and soups. 100% Compostable Forks - 140 Large Disposable Utensils 7 in. Eco Friendly Durable and Heat Resistant Plastic Forks Alternative with Convenient Tray by Ecovita - 50 in each case, 9" Plate. Bpa free. This is the main reason customers look for compostable utensils certified by BPI and TUV meeting high standards ASTM D6400 & EN 13432 like Ecovita. If not, lunches, picnics, we will gladly give you a full refund!. Certified compostable breaks down in a matter of months. Tested using the astm d5511 test under conditions that simulate both wetter and biologically active landfills. 50 in each case, 11. 5 oz.